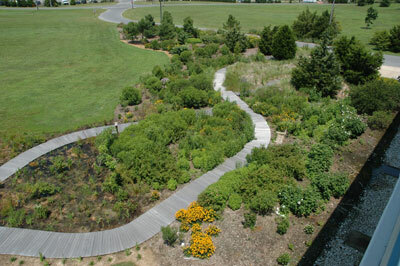 The Native Plant Demonstration Garden, located at the University of Delaware's Hugh R. Sharp Campus in Lewes, features a beautiful array of coastal wetland plants set amongst dunes and a handicap-accessible boardwalk. The Delaware Sea Grant Program constructed this garden in 2004 using assistance from many organizations, one of which was the Partnership for the Delaware Estuary. It was added to the "Rain Gardens for the Bays" campaign in 2010. See how this works at RainGardensfortheBays.org. Anyone residing in the mid-Atlantic region is encouraged to participate.